It’s your Google Activity (formerly known as Google Web & App History), and it knows everything you’ve searched for… dating back to 2005. Yikes! This post will teach you how to permanently delete your Google history to enhance your internet privacy and prevent your search and browsing data from following you around forever. Note: Clearing your browser history is NOT the same as clearing your Google Web & App Activity history. When you clear your browser history, you’re only deleting the history that’s locally stored on your computer. Clearing your browser history doesn’t do anything to the data stored on Google’s servers. 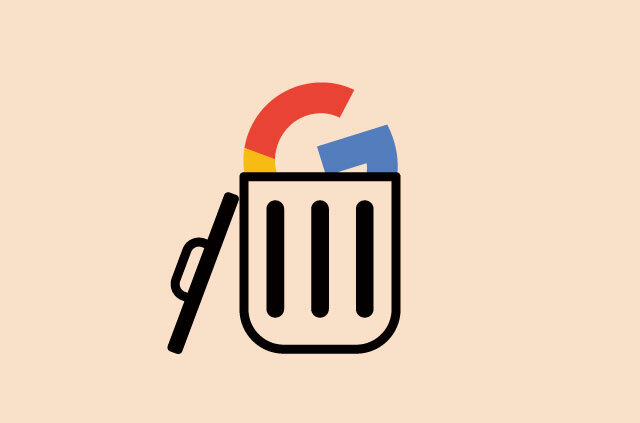 Warning: If you use G Suite (formerly Google Apps for Work), it is vital that you find out your company’s acceptable use and data retention policies before you delete anything! ExpressVPN believes what you do on the internet is private. Nobody should be keeping tabs on what you do online—not without your knowledge and permission, anyway. 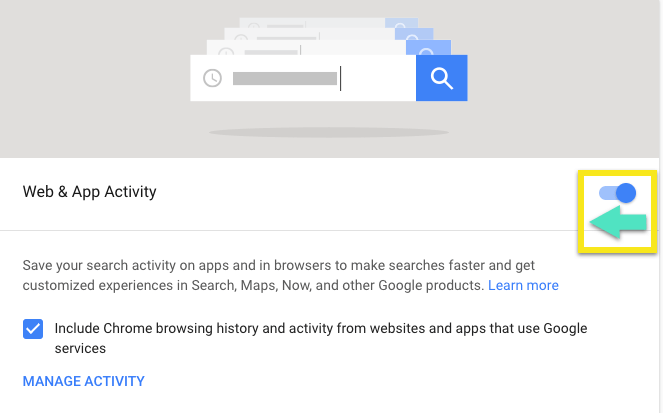 Unless you’ve disabled it, Google Activity has been keeping a record of your search and browsing activity for the last decade. It knows every link you’ve followed, every image you’ve clicked on, and the URLs you’ve entered in the address bar. Google uses all this data to construct a profile about you, including your age, gender, languages, and interests, and filters search results and ads for you based on your profile. Pretty clever, right? But this is also an incredible invasion of your privacy. Don’t let your Google search history haunt you forever. 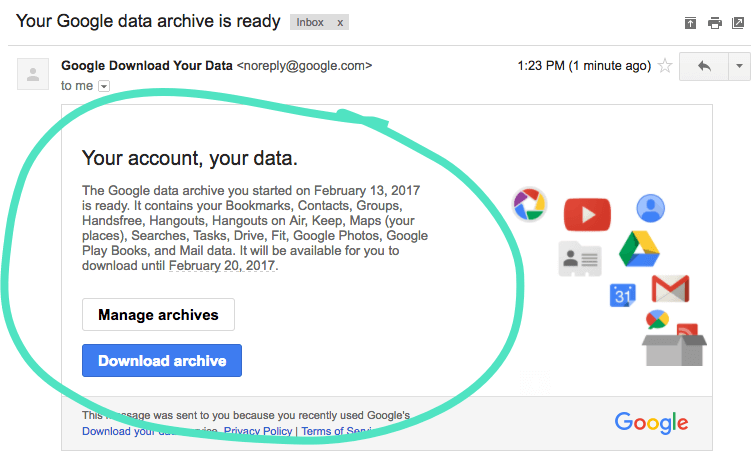 In April 2015, Google quietly released a feature enabling you to download all of your Google data. If you’re feeling sentimental (sniff), you might want to consider downloading your search data before you delete and disable it forever. 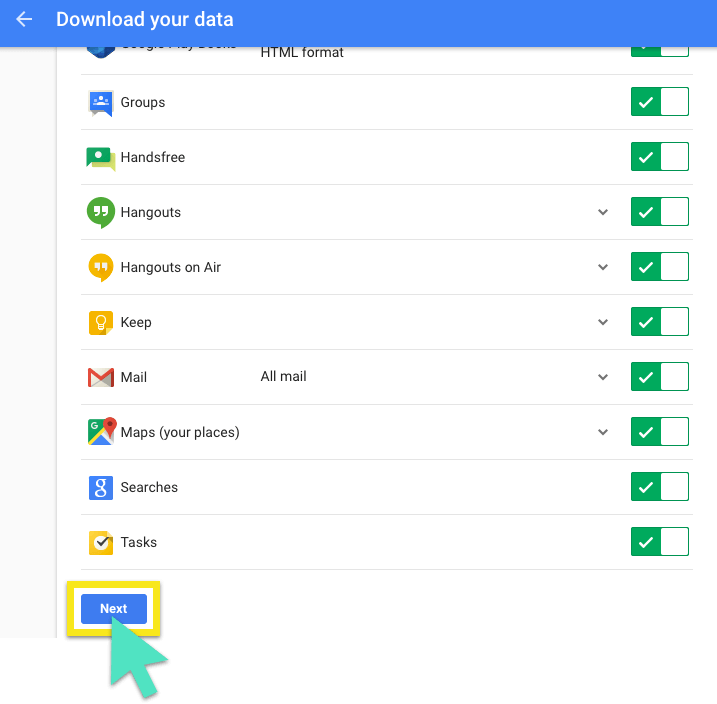 Google’s Takeout feature lets you download data from all of the Google products you use, including your Google Search history, Gmail, Calendar, Chrome, Google Photos, Maps, and more. 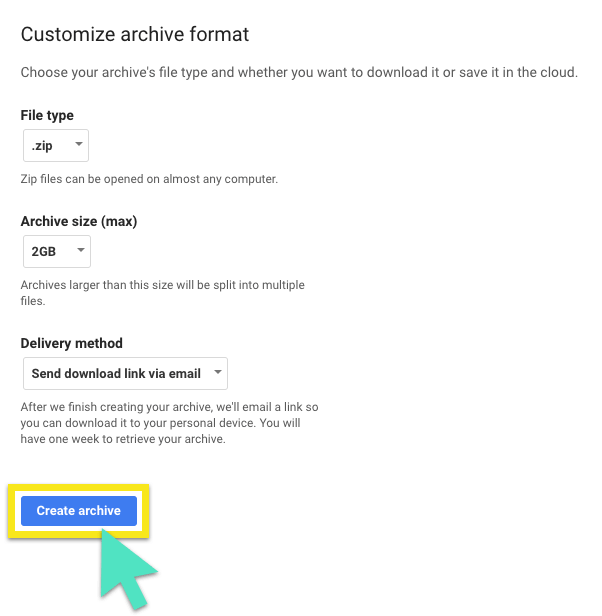 Here’s how to use Takeout to download all your Google data. Step 1: Go to the Google Takeout “Download your data” page and select the data you’d like to download. By default, all of the boxes are selected. Select Next. Step 3: You’ll receive a notification when the archiving process is complete. In this example, we received an email with a link to download our archive. Now that you’ve downloaded an archive of your data, you’re ready to delete your history. 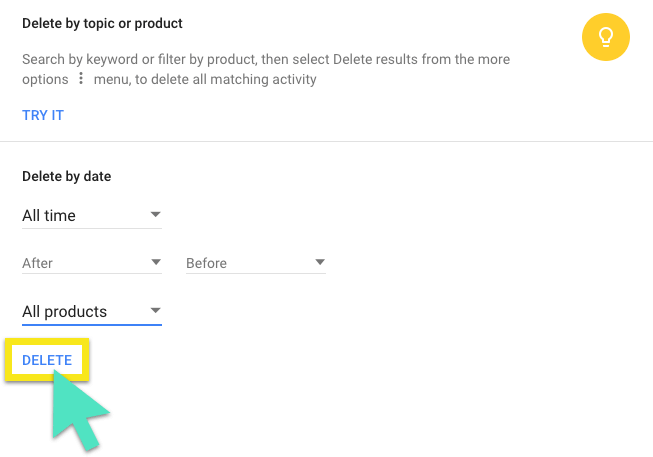 Use these steps to delete data about all your Google activity, including your searches, video searches, and any ads you’ve clicked on. Step 1: Go to the My Activity page, select the vertical ellipsis (⋮), then select Delete activity by. Step 2: Change the date from Today to All time. Select All products from the product drop-down menu, then select DELETE. Step 3: Google will tell you how it uses your data to make its services more useful for you. Select OK. 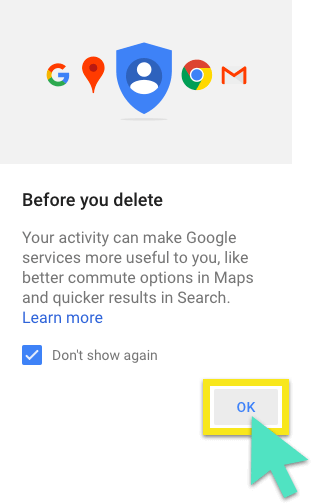 Step 4: Google will ask you if you want to delete your activity. Select DELETE. Congratulations. You’ve now deleted your Google search history. Here’s to blank slates! Next up: Get Google to stop saving your activity. Google doesn’t provide a way to permanently disable it from saving your activity, but you can hit pause. 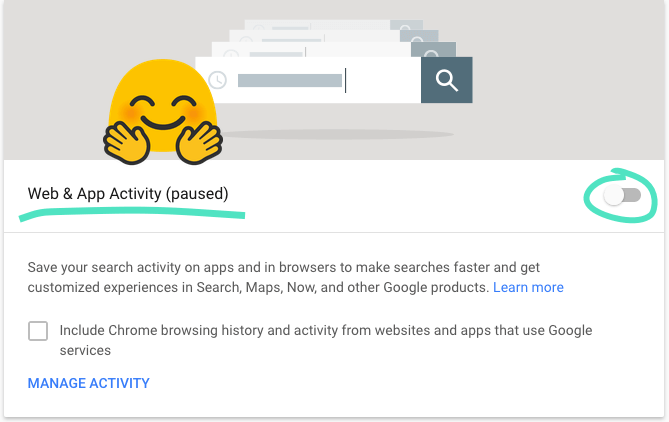 Use these steps to hit pause on Google saving your activity. Step 1: Go to the Activity controls page, where you’ll see a section for “Web & App Activity.” Slide the switch to the left. 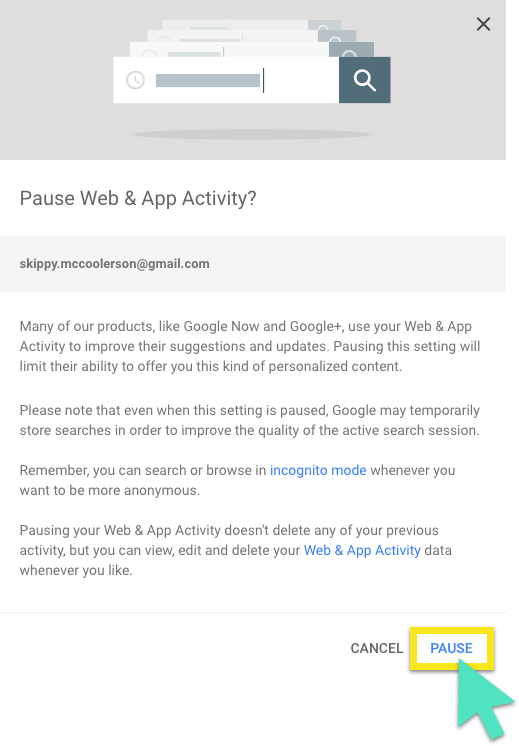 Step 2: Google will ask if you’d like to pause your Web & App Activity. Select PAUSE. Step 3: Check to see if your activity is paused. The screen should say “Web & App Activity (paused)” and the sliding toggle should be gray. 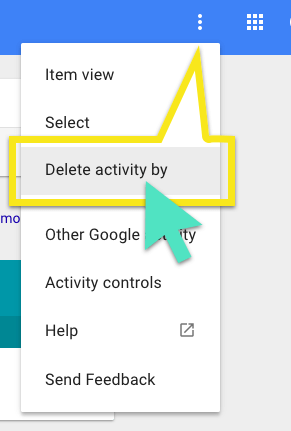 Step 4: If you want to hit “pause” on Google logging your activity on ALL the Google apps and services you use, slide all the switches on this page to the left. Read the important information for each item and select PAUSE to complete each step. Mission accomplished! Google won’t be saving your search data anymore. It’s important to understand the consequences of deleting your Google search history. By default, Google personalizes your search results based on your search activity. So if you search for recipes and click on links from allrecipes.com more frequently than all other websites, then Google will rank allrecipes.com higher up on the search results page every time you look up a recipe. If you delete and disable your history, then your returning search results will be broader and less specific to you. So allrecipes.com won’t show up at the top of the results, even though it’s your favorite site. If you delete and disable your history, you are not invisible to Google—especially if you maintain a Google account for using various Google apps and services, such as Gmail and YouTube. The reality is that it’s pretty much impossible to be invisible to Google. But you can be prudent. Start by eliminating all Google apps and services from your daily web use. And use search engines that don’t track your search activity, such as DuckDuckGo, Ixquick, and Startpage. 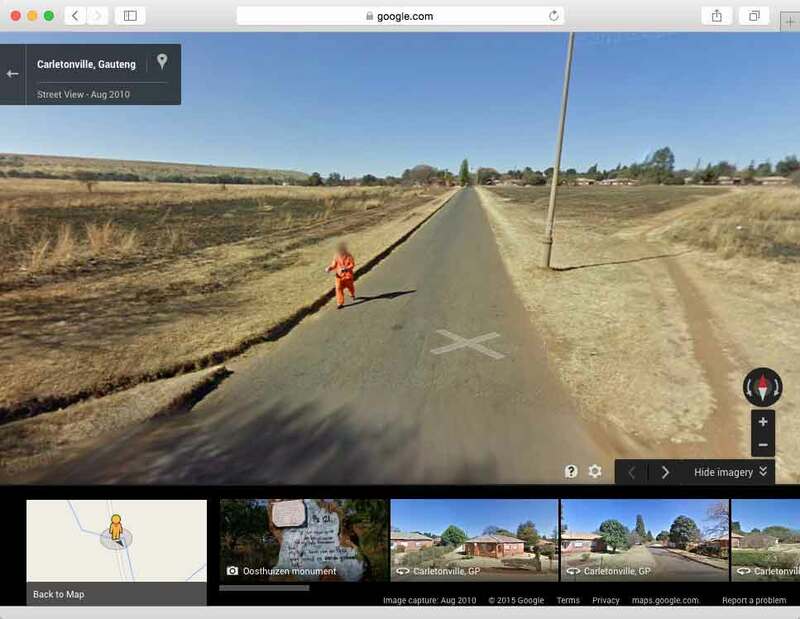 Caught on Google Street View: No bushes in sight for this guy to dive into! Now if you REALLY want to step up your internet privacy game, here are more steps you can take. What do I need to back up, to have a working computer after hard drive clean, and how do I back up? ( computer novice). If I delete all of Google history, will my emails be deleted too? The process says that deleting history includes deleting ‘mail’ – does that mean all the emails are gone? Yes, if you delete your google account you will also no longer be able to access your Gmail. Make sure to back up everything! Delete everything I searched from the first day. I no longer need them. Is there an easy way to delete Google history .? Its a human tendency to hide their internet search activities with anyone. So its better to erase everything on daily basis. I am trusting a tool called BitRaser for all these activities and till date it never disappoint me. For the life of me ….. I CANNOT ….. figure out how to to delete my search history. This is not cool!! I have heard things about google . I just want things gone. * I knew how to do this.. But didn’t know about the pause option . * My question is how can I recover deleted search history from my activity. * I need lawyer to subpoena history wondering if google company can do that. This is dealing with a criminal matter and trying to get back what I accidentally deleted because my phone was water damaged and deleted it while I was scheming through it. And need it very bad for my defense. Please give me an answer thank you.. This article is horribly out of date. Hi Joseph! We’re trying to keep the guide always up to date. Which stop didn’t work for you? Will try to replicate and update as soon as possible. “We’re trying to keep the guide always up to date. Which stop didn’t work for you? Search is no longer on the list as described in Step 1.
i can not sign in my google a/c cuqueis and catch does not deleted. I am 90 years old. I play games an use emails. nothing else. This was a very good article to understand how to use gmail account and delete history. I am concerned about my privacy and my searches. Not only did I do what I needed to do I did it so quickly and learned a lot more about having a google account. This was so easy to follow. Thank you so much! Thank you for your kind words! Really means a lot to us! The guide is also available as a PDF. Just print it out and follow the instructions! Let us know if there is a particular step that you don’t understand. As a American , I need all my freedoms back using the Internet and delete all past , present and future activities. I just want to dekete all unwanted and port and adult websites from my computer and moto g-2nd gen mobile.. I have tried to delete all my google activity to no avail. I went into my google account and to Activity and deleted every single item from 2014-2016 today. It asked me to verify by delete-delete. I turned off my iPad several times. I went back and did the deleting procedure again. The whole history IS STILL THERE!!!! I am frantic because I cannot deal with illogical situations. Delete google history search. Thanks. Thank you for this excellent article and instructions. 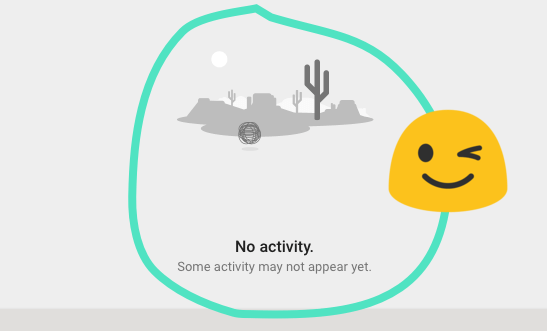 I went to my activity (didn’t even realize that I had a Google account before I tried to log in) and found there was almost nothing in my history. Today’s Google searches did not show – basically nothing except 13 old searches or YouTube viewings from February and April. Nothing came up under web activity (because I use FireFox instead of Chrome?) Did I miss something that might be there or are they keeping less than everyone thinks? I’m confused what if you don’t even have a google account so you’re never logged in? Then there’s no where to go to delete the history associated with your ip address? Hello, thank you for this wonderful article! I read that if you upload a picture in the Search By Image function of Google, Google will also store those pictures. Do you know if these get deleted as well? How do I print your instructions? Thanks very much for this clear and helpful post! Do you know if deleting all your history also actually deletes it with Google or do they still hold their own copy of your behaviour for their own (or governments’) purposes? What can / do they store if you are not logged in to any Google account? I’m curious about that as well. As far as I know this doesn’t delete everything as google will still keep records for auditing purposes. Googles latest policy is that they will anonymize the last octet of your IP address after 9 months (This could prevent someone from identifying you but they could still isolate your locality). Within 18 months they will anonymize cookies with a HMAC key hash function using a randomly generated key for each day of logs that will get deleted immediately after anonymization. These practices also applies to back-ups on tapes. How long google keeps the anonymized data there-after I’m not really sure. If you have or had a google account (gmail, etc.) they have two independent systems. The web search server will log a query without your Account ID or email and at the same time your Web History Database is updated with the search query. This can prevent third parties from identifying you but wont do much for government or law enforcement. 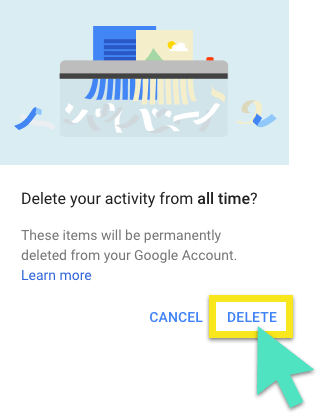 If you wish to delete your account it could take up to 90 days at which point everything is wiped but the email address since google does not recycle them. This is my best understanding of the policy. This comment was so great, we’ve decided to add some of it to the main article. Thank you, Kyle! Thank you for this post. Really helped me. please take google off my computer! Hi there, we’ve just updated the post with the latest instructions. Should work fine now! Does anybody know if this will this delete all my emails from google accounts too? Very useful……this has concerned me for some time. Hello, please refer to the section “Remove all of the records from your Web & App History” of this page. If you need further help, feel free to contact us via Live Chat at our website (http://expressvpn.com/#open-chat) and we’ll assist you from there. Did you follow the steps in the guide Let us know if you have any problems with it. I need to delete my past browsing history . Hi Peter! Did you follow the guide? Anything unclear?